It is just another day in my routine. Woke up, had to hurry up, ran to catch the office bus having both handbag, lunch bag and my heart relaxed for only after I got into the bus. When wiping off my forehead sweats, using my hanky, my ears were hearing a louder voice and my head spontaneously turned to my back. A teen-age was talking over her mom on how to cook a simple rasam. We as food bloggers sometimes need to break our head for some new recipes (some of you try very innovative recipes, I say). There is a crowd out there who don't have much idea on cooking those simple, yet traditional recipes. It happened to be the same day when one of my colleagues asked me the recipe for a plain dal recipe . Hand on my head!!!!Gosh... I felt a need for a basic recipe in my blog that could help many. No doubt if I compile a post of many simple yet basic recipes. Stories apart, Now off to such a basic recipe - Keerai Masiyal also known as Keerai Kadayal. Again, today's recipe looks simple but it certainly needs some experience to cook it . My MIL always insists that the one who can cook any kind of greens perfectly is the one who can be called an expert in cooking. 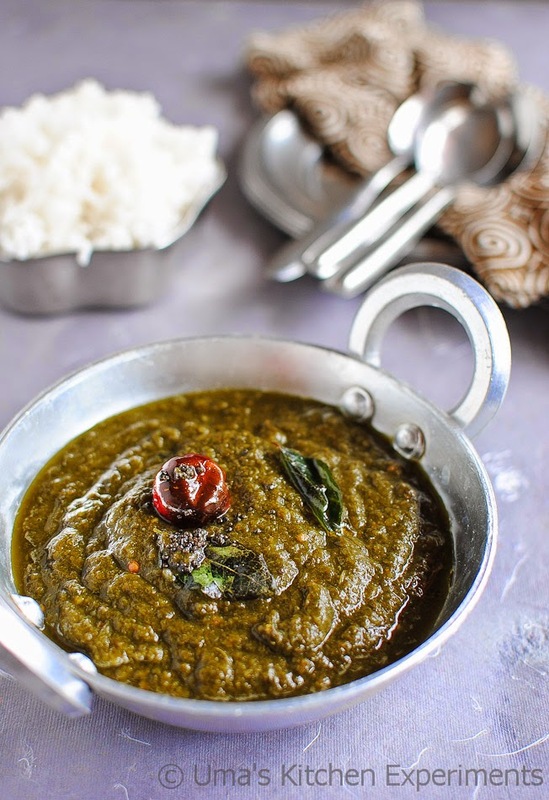 Traditionally, Keerai Masiyal is prepared out of steaming the spinach and mashing it using a mathu (A wooden ball headed spatula) in a rough surfaced earthen pot. In this modern age the entire process is done by a mixer jar as said below. 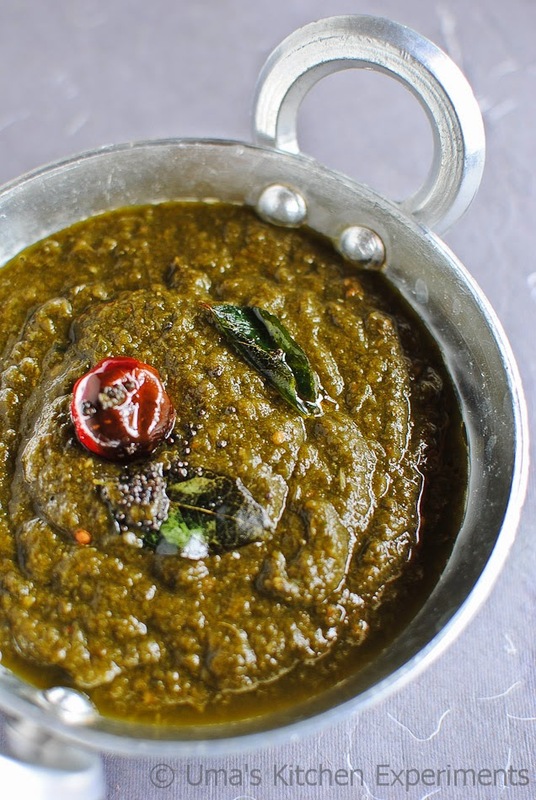 Any Green(Keerai) can be used for this recipe. The recipe video is given below. Please subscribe and share the Indian Curry Trail You tube Channel. 1) Wash the green and chop it roughly. Heat water in wide pan. Add onion, tomato, green chilli and garlic cloves. Add tamarind and add cumin seeds. 2) When it is roll boiling, add chopped spinach to it. Mix well and cook it in the low flame till the spinach has cooked well. It takes only few minutes. 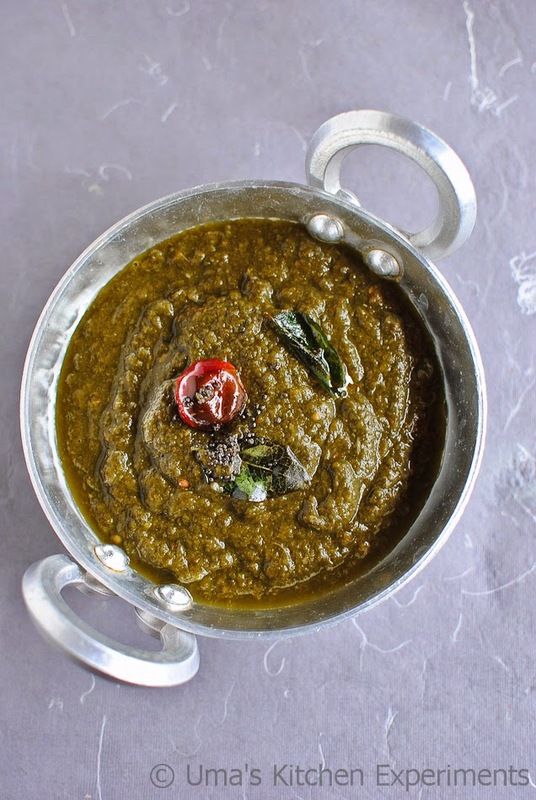 3) Once done, cool it for few minutes and grind the cooked green mixture alone using a mixer draining the water in a separate bowl if any. 4) Add salt to your taste while grinding. When the consistency is smooth, transfer it to a bowl. Use the saved water to rinse the mixer and pour to the ground spinach. Mix well. 5) Prepare seasoning separately and add to the ground spinach. 6) Serve with cooked rice. 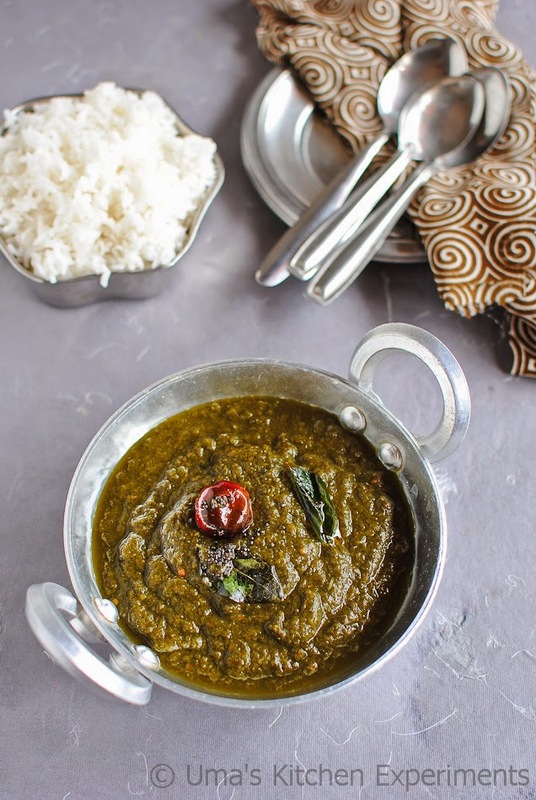 1) To cook spinach without changing its colour, Cook it without covering the pan. However, if you use tamarind there is a chance of changing the colour. 2) Don't grind it to a very smooth consistency. Semi smooth grinding gives the authentic look. Yum yum healthy keerai. Loved the rich color. wow! looks so tempting and wonderful! such a tempting curry.. yumm..
always my fav one.. yummy prep..
Masiyal looks so inviting and delicious. That too after you have such a hectic day. It is said with the intention that small or single pulp of tamarind.